How do you convince 1,000 people to converge at 6 a.m. on a Saturday to join a running event? You ask Meyrick and Perl Jacalan to promote the event. The owners of one of Cebu’s top advertising agencies—ASAP (Advertising Services and Promotions)—this couple helped organize last weekend’s highly-successful Mizuno-Shell Sinulog Half-Marathon. Energetic, young and overflowing with creative ideas, Meyrick and Perl are even more than that: they’re passionate and possess an attitude that says, “Go-Go-Go!” And because of the two, the Sinulog Run convinced big-name companies to sponsor: Mizuno, Shell, Mazda, Burlington, Alcordo Advertising, Holiday Gym and Spa, Cebu Globenet Realty, Activa Kontra Arthritis, and Infinity Colors (among others). You don’t do it by yourself—but function as a team. Take the president of the Cebu Executive Runners Club (CERC), Jesse Taborada. It wasn’t Jesse alone who spent late nights working to make the Sinulog race a success—but his whole family. I saw for myself how Jesse enlisted that “team-work” spirit with the help of his wife Bebie and their five children: Geigy, Kitty, JJ, Jason and Jon. So when the participants picked up their singlets at Jesse’s family-owned Sug-Angan Restaurant, they were assisted by his six family members who all volunteered. It’s called Family Power. How do draw a strong field? You convince elite, national-caliber athletes to join. And they joined. Elmer Bartolo, a Davao City-native and winner of numerous runs, won the Half-Marathon last weekend with a time of 1:10:20. And because there was no official 21-K record in the RP books, “Elmer Bartolo” is now the official Philippine record-holder. At second place was Jet De Asis. He comes from Manila, clocks 14-minute 5-K runs, and joined, just six days earlier, the Clark International 42-K Marathon—which stiffened his legs. Still, he place 1st Runner-Up with a time of 1:11:10. Women’s race? Ah, it was a no-contest. Well, not exactly. 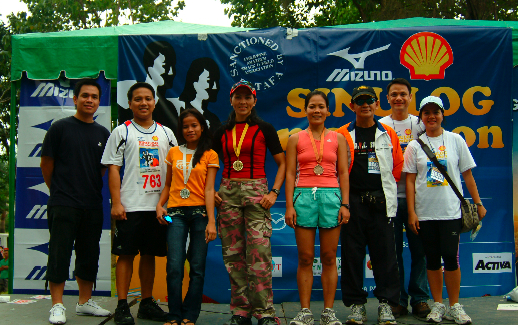 Because while Liezl Geteruelas joined 16 races in 2007—winning all 16 of them—at this race, she was trailing, with just three kms. to go, Mary Jane Beboso. But then the champion that she is, she upped her tempo, overtook the 18-year-old Beboso (who finished second) to win the champion’s medal and still be proclaimed, “The Queen of Running” in this Queen City of the South. How do you wish for success? You have participants. Lots and lots of participants. For what good is promoting an event if no one shows up? 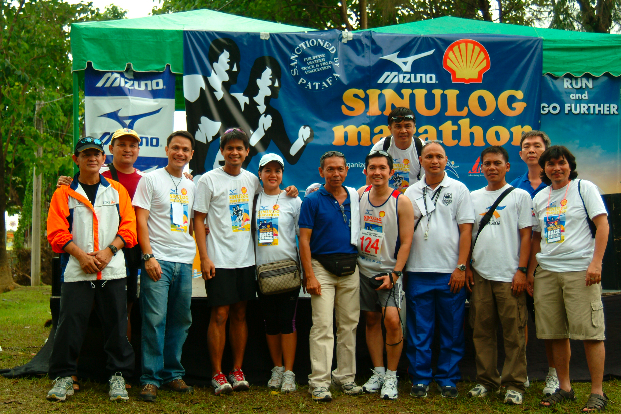 And with the Mizuno-Shell Sinulog Half-Marathon, a thousand runners joined: grandparents, children as young as 10 years old, elite marathoners, New York City Marathon finishers Dr. Yong Larrazabal and Dr. Peter Mancao joined, and even first-timers like my brother-in-law Francis Palmares and his wife Michelle. How do you ensure an event is well-run? You have technical experts. Led by race director Raffy Uytiepo (who boasts dozens of years of experience) and technical director Joe Deresas (a Cebu Sports Hall of Fame awardee), with the help of Prescing Capangpangan, you have a qualified set of officials to ensure that technical problems don’t surface—or are answered in a sprint. How do you pray for success? You pray. Like we all did. We prayed that no untoward accident would befall any runner. (Granted). We prayed that the weather will be fine. What happened? While Cebu was poured with rain everyday before last Saturday, our Almighty upstairs made sure that from 5 a.m. until minutes after we finished the awarding at 9:30 a.m., rain didn’t shower on the runners. Coincidence? Luck? No. We call it…… Blessing. 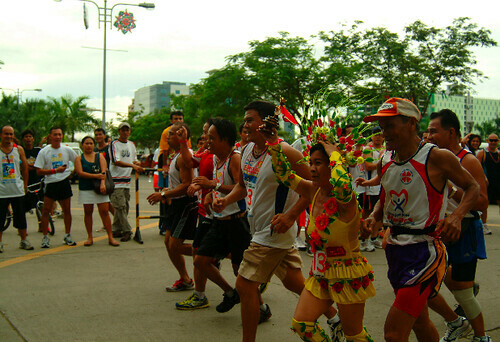 I read with interest the success of the 2008 Sinulog Marathon and I am thinking of participating next year’s marathon. So as soon as you hear about the planning for next year’s event, please send me an envite at my email address, dmascardo@comcast.net. P.S. 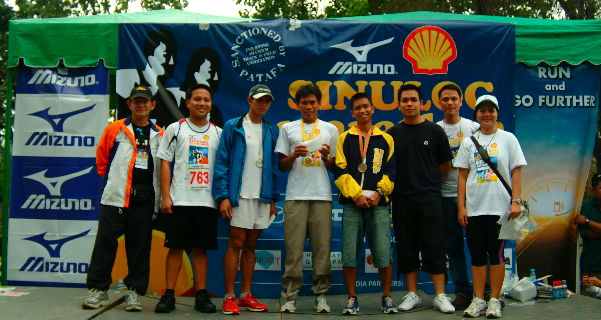 Please forward my name and email address to the Sinulog Half-Marathon 2009 organizer. Thanks much.